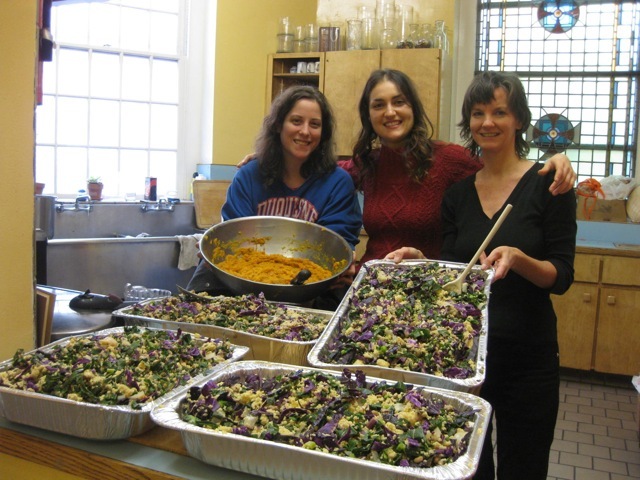 Occupy Wall Street asked us last week to prepare two lunch meals to be served over the weekend for a conference with the Medical Working Group. There were 35 participants both Saturday and Sunday, so we made a variation on a similar recipe for each day. Special thanks to our donors who have been paying for the food, including the lovely gentleman who saw me carrying my pressure cooker out to my bike. After he heard that I was cooking for OWS he whipped out his wallet to donate to the cause. We’ve also been taking cash donations at the co-op, and now we have a way to donate online! We’re just about tapped out of our cash donations, so please know that these meals are being appreciated. We extend our 20% discount to all food purchases for OWS. For the two meals, Lisa, Lauren, Vanessa, and I made millet combined with black eyed peas, red cabbage, collards, and a lime cumin vinaigrette. The other meal had millet plus lentils, roasted red and golden beets, collards, with a lemon cayenne vinaigrette. We also made a side dish of roasted butternut squash, mashed with ginger and agave. All the fresh produce for the meal came from Lancaster Farm Co-operative except the beets from Vermont, and the onions and garlic. 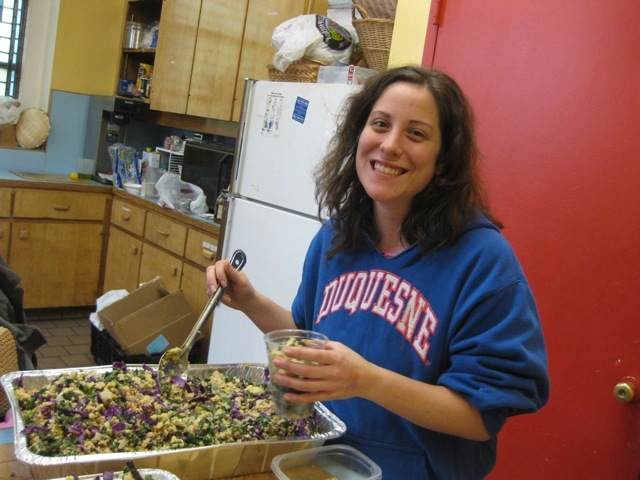 We hope we can continue to contribute healthy, organic meals to help the OWS Kitchen Working Group. This entry was posted in Co-op News & Events and tagged Lancaster Farm Fresh Cooperative, Medical Working Group, occupy wall street, OWS, St. Mark's Church. Bookmark the permalink.